closing up the river where the salmon swam. Gnawing down trees and ferrying the logs. Slapping on the mud that they gathered from the bog. and one little beaver swam away. Five little beavers are hard at work on their dam until, one by one, their forest friends pull them away to play. After visits from a muskrat, a heron, a frog, and a turtle, there’s just one hardworking beaver left at the end of the day. But when the fifth tired beaver leaves her sticks and mud behind and heads back to the lodge, a big surprise awaits! With catchy, playful rhyme, irresistibly cute illustrations, and a supplementary page of facts about all the species featured, Five Busy Beavers makes counting and learning fun! Stella Partheniou Grasso is the author of There Was an Old Lady Who Swallowed a Puck, Over at the Rink, and 101 Creepy Canadian Jokes. 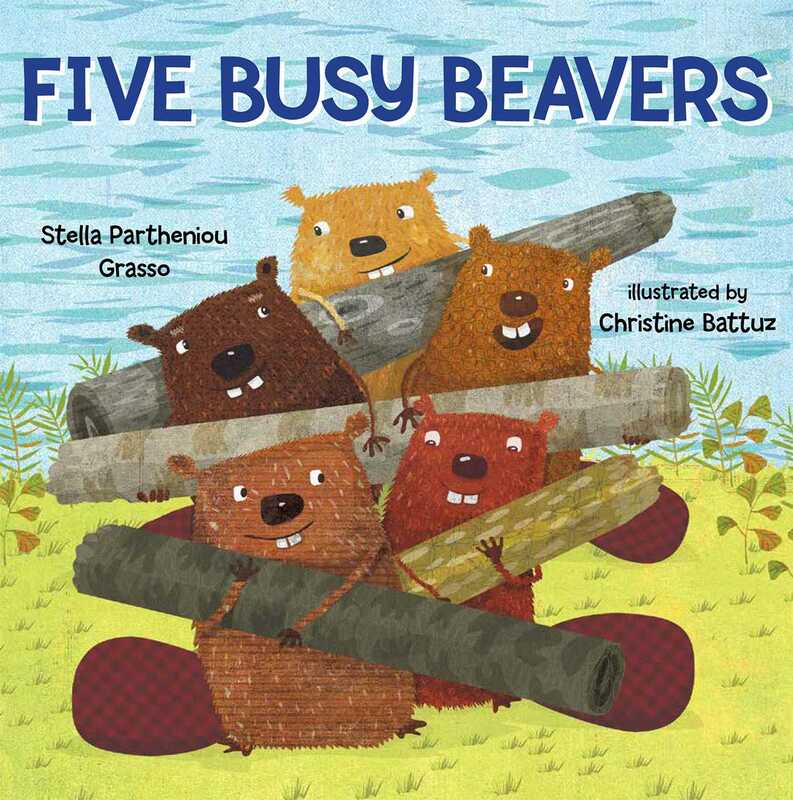 She wrote Five Busy Beavers after she found a stick on the shore at her cottage with bite marks where a beaver had felled the branch. Stella and her family spend as much time as they can at their cottage, and the rest at home in Ajax, Ontario, Canada. Christine Battuz is an illustrator and designer living in Quebec, Canada. Her work has appeared in textbooks, novels, magazines, and greeting cards, but Christine’s favorite type of work is illustrating books for young children. She has many picture books to her credit, publishing in French and English in North America and Europe. "Equally well-suited for storytimes and budding naturalists . . . This good-hearted alternative to those five little monkeys is as hardworking as its subjects."